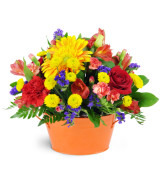 As the seasons change, give a gift that will leave a lasting smile on their face. 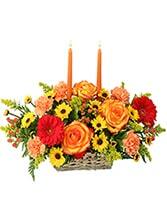 This array of harvest hues is a memorable bouquet, perfect for every Autumn moment. 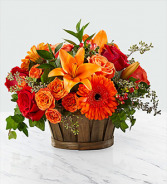 Presented in a rustic, dark wooden basket to create an arrangement ready to be used as a centerpiece or decorate a countertop or console table, this makes a perfect seasonal gift. A little box of tropical sunshine! 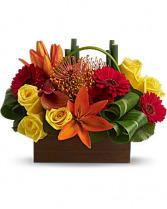 Bright orange, red and yellow blooms form a magical, modern mosaic inside a chic bamboo container. Arrangement shown as one-sided.